We all like to improve our homes. Some improvements take very little money and effort, others take a large bank roll and super human effort. Mine fell somewhere in between. Here’s our story. Andrew and I are in a two-story loft, about 750 square feet on the first level, and the upper balcony level is about 350 square feet. 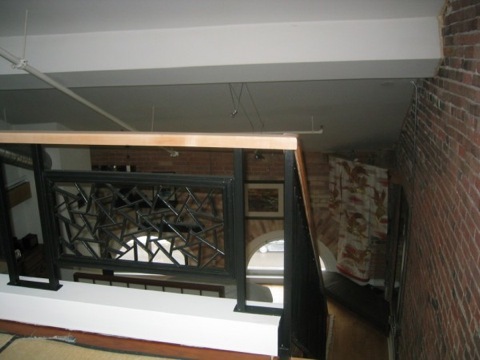 The building was originally built around 1855 as a warehouse and around 2002, the conversion created unique loft spaces (some with much better flow than others), but all have period charm with exposed beams and brick. 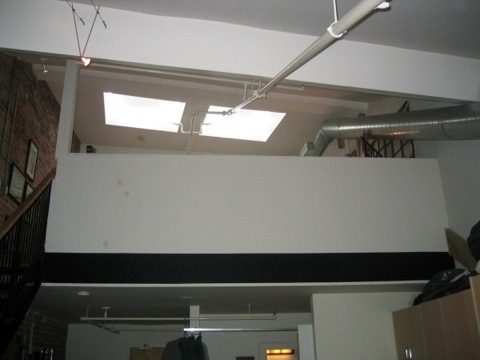 Our two-level loft is on the building’s top floor so our 25′ wide ceiling runs on an angle for a length of about 80′ and is punctuated with two skylights on the top level. 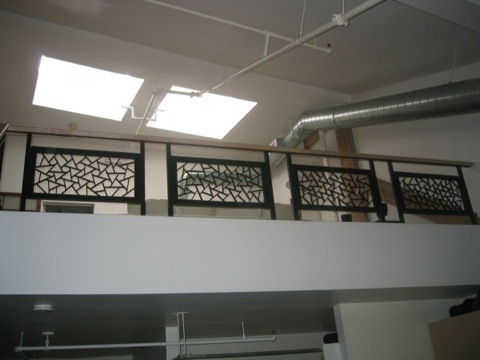 The second level’s closed-in balcony wall featured prominently in the loft’s original design, in an unsettling, unsightly manner. The wall was built from drywall and stood just over 4 foot high. It saved us from falling over, but it was so plain, so white, large and blocked the internal sight lines. There was also an annoying square support that reached from balcony to ceiling at the top of the stairs. When viewed from the lower level, it was a solid mass, seeming co-joined with the large ceiling expanse. It needed to go. balcony wall. After a year of looking around outside the city at architectural salvage businesses, we found 4 Asian wood panels downtown at Biltmore on Sherbourne Street (3 blocks away from our loft!) 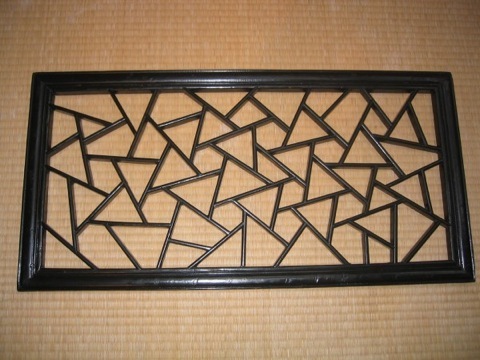 The decorative pattern is known as “cracked ice”. Funny…once you learn about this Asian pattern, you start to see it in decor pics etc. Next we planned a work schedule and sought out a metal worker. Mike D’Albertanson at Metal Design Fabrication (416-457-4594) is a talented, hard working guy. He took our basic idea, improved upon it for installation purposes, and created posts and cross members to hold the Asian panels. Once we had the panels in production, we felt confident to tear down the half wall. It took about 5 hours on a Saturday from start to finish (including time to bag it all up). I was prepared with 15 large paper bags used for leaves and garden waste. I slid the paper bags into a large plastic bag cause I had to drag the bags down the elevator to ground level. I didn’t overload any bags and kept the weight to a manageable level. Sunday around noon my rubbish removal guy showed up with his truck and took away 15 bags of drywall and metal studs. The ugly 6″ square support that ran from the railing wall to the ceiling beside the staircase, turned out to house only one electrical wire to a ceiling lamp box. Andrew was able to re-route this wire (a length went under the top stair, and a length went across the ceiling under drywall requiring a 3 foot long patch). 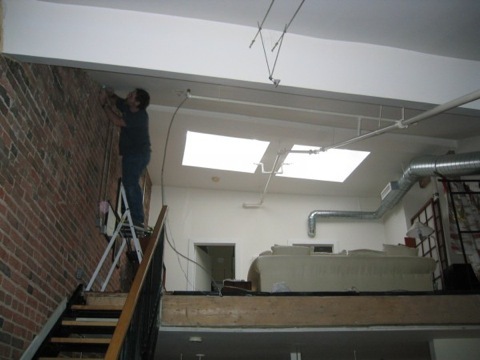 He tidied the exposed wire with conduit pipe and ran it down the brick wall. We kept busy over the next few weekends with lots and lots of dust clean-up, securing a 6″ high wood and drywall sill for the new railing to sit on, sanding, painting etc and then we waited for the railing to be created. In the meantime, Andrew’s father handily milled lengths of maple wood to match the existing handrail on the stairs. Matching the handrail became a vital design feature for harmonizing the new rail with the existing stair handrail. It was an exciting day the railing was delivered and installed. 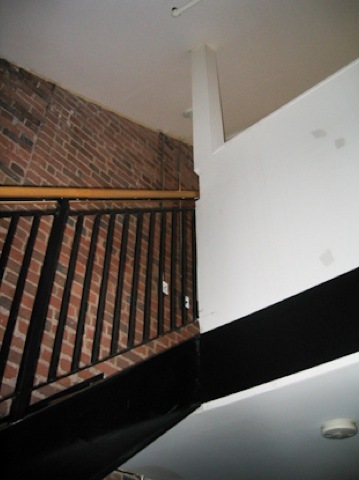 A coat of black paint and the addition of the maple handrail completed the project. Now its complete, we are thrilled with the open site lines and open flow. The space now feels every inch of its 1100 square foot size and now we have window views and more day light. An unexpected bonus is the artful shadows cast by the railing, sometimes at unexpected times by streetlights or moonlight. I hope this encourages anyone who is considering such a reno. Think it through, plan a schedule and three months into the reno, stay focused and keep at it until every last detail is completed. 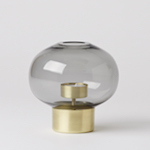 The dust will eventually settle and the space is all yours to enjoy peacefully. Someday soon, I’ll write another chapter for the blog about what happened next in this winter’s home improvement season.